Dum Dum Dum, Dum-te-Dum, Dum-te-Dum..
Suit up in your Storm Trooper outfits, Star Wars fans because Star Wars Miniland has finally opened up on Legoland Malaysia down south. The launch was officiated by Mark Germyn, General Manager, LEGOLAND® Malaysia Resort and Dato’ Dr. Ong Hong Peng, Secretary General, Ministry of Tourism Malaysia and was attended by Malaysian media and bloggers as well as our Singaporean counterparts. In true Star Wars geek out, there were many cosplayers at the launch, dressed up and posing as the famous characters from the very popular Star Wars films such as Darth Maul, Darth Vader and the Jedi. Due to height issue, no one could cosplay the iconic Master Yoda. But undoubtedly the most popular mascot that everybody wanted to take pictures with was...LEGO Darth Vader. Because he was just so cute! You can't miss the Star Wars Miniland Model Display in Legoland as it is easily spotted with the life-sized version of Darth Vader at the entrance. As you make your way to the entrance, you will see R2-D2 and C-3PO before entering the exhibition. We got a sneak preview of Lego Star Wars Miniland and got to see all seven exhibitions in the octagon shaped building. While we were inside, it started pouring outside and I must say, thank goodness the new attraction is the first ever of its kind in Asia to be housed indoors with air-con! The attraction features seven scenes from the six Star Wars™ live action films and The Clone Wars animated series in great detail. In total, the attraction features more than 2,000 LEGO® models built to a 1:20 scale using 1.5 million LEGO® bricks. The seven scenes features iconic scenes from planets such as Naboo, Geonosis, Kashyyyk, Mustafar, Tatooine, Hoth, Endor and Christophsis. Visitors can take a chronological walk through the STAR WARS™ timeline to marvel at the models, including the approximately 8-foot tall building from the Crystal City, the largest of all the LEGO® Star Wars™ models and the iconic Millennium Falcon made up of 19,200 LEGO® bricks – reaching 1.8m long and 1.3m wide. Meanwhile, there are also interactive buttons that you can press to see the scene come to life! 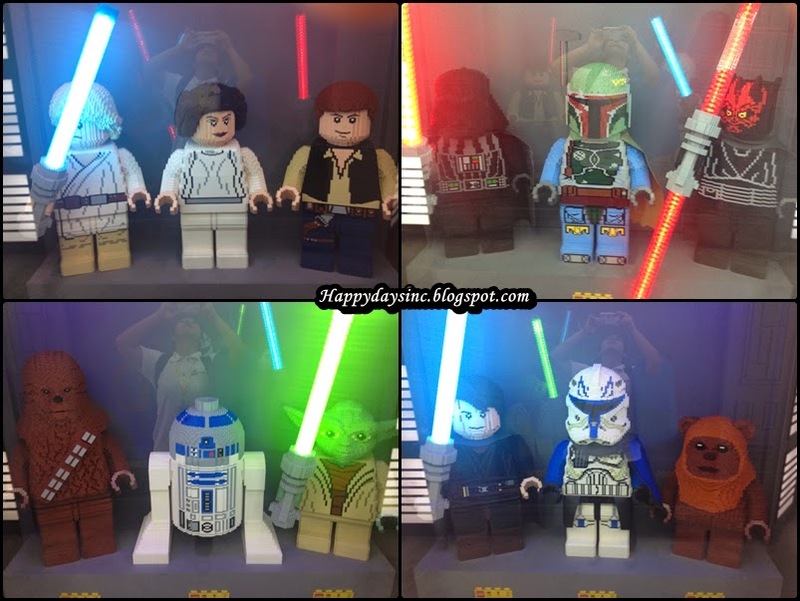 The building also has a store where every Lego Star Wars fan can go crazy with the wide selection of Lego sets available as well as purchase Star Wars figurines in their Lego form. And after parting with your hard-earn cash, you will be bide farewell by these 12 Star Wars Minilanders. As much as I wanted to take one home, the figurines are secure within a glass panel... dammit. Before leaving, I filled up my tummy with the cafe's Galaxy Combo (RM35) which consisted of a chicken or beef lasagna, Heaven and Earth ice lemon tea and a cup of coffee as well as a Star Wars magnet. Pretty worth it especially if you are planning to share. The mocha drink cost RM7. Throughout the month of September, various LEGO Star Wars™ activities have been lined up to commemorate the anniversary celebrations. Amongst this is free entry for children dressed up as their favourite Star Wars™ characters. The promotion will be from 6 – 30 Sept 2014.